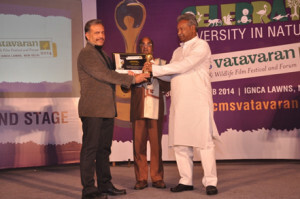 CMS VATAVARAN Prithvi Ratna Award recognises an individual who have made outstanding contributions towards environmental and wildlife film making in the country. This award was institutionalised in 2003, as a means to recognize Indian filmmakers for their outstanding contribution to nature and conservation filming throughout their career which has resulted in bringing change in perception, practice and policy with regards to environment. Our previous Prithvi Ratna awardees are eminent environment and wildlife filmmakers from the country, Mr Mike Pandey, Mr Naresh Bedi, Mr Shekar Dattatri, Mr Krishnendu Bose, Mr Ashish Chandola and Mr Sanjay Barnela. Nominee must be an Indian citizen. Minimum period of involvement should be 10 years. The Prithvi Bhushan Award has been established to recognize and honour the outstanding contribution of an individual towards conservation of environment with demonstration of exemplary leadership, ground impact and uniqueness in approach. It endeavours to recognize efforts and achievements that have benefitted the environment and promoted human welfare. Prithvi Bhushan 2015 will be awarded for contributions in the field of water conservation. Nominee may be a Government employee but should be involved in the conservation work beyond the call of his/her duty. Individuals should be engaged in the environmental and wildlife conservation activities as a selfless service and not only as a part of any project or institution. The winner of the award will be selected based on their level of leadership, equity and accountability in the conservation management, and effectiveness in conserving it. For Prithvi Ratna and Prithvi Bhushan, each Award carries a Trophy, Citation and a Cash Prize of Rs 1,50,000/-. Please send information regarding the work of the nominee and broad fit with the mandate of award which may include resume and a passport size photograph along with working photographs, videos (if possible), certificates, recommendation letters, etc. For Prithvi Bhushan, showcase tangible and intangible benefits and effectiveness of conservation management, improvement in area covered, improvement in regeneration status and innovative approaches. These Awards will be announced and felicitated on October 11, 2015 at New Convention Centre, New Delhi at the Gala Awards Function of 8th CMS VATAVARAN Environment & Wildlife Film Festival and Forum.